Aaron Lee says knockoffs make it even tougher for authentic Indigenous artisans struggling to get by. (Andrea Huncar/CBC) artist Aaron Lee weaves sinew inside a tear-shaped willow frame, crafting another one-of-kind dreamcatcher. The sinew is purchased locally, the willow collected in Edmonton’s river valley; all created with a prayer and the wisdom passed down from his family of artisans at Ermineskin Cree Nation. Those skills were on display Thursday at a table in the Edmonton Expo Centre. In his two dark braids, brimmed hat and snowy goatee, Lee stood out among a few dozen vendors at the National Gathering of Elders in Edmonton. But the simultaneous sale of Indigenous knock-offs at an Alberta event meant to promote Indigenous culture sparked fresh criticism. “It’s time for us to stop allowing other people to take what’s not theirs,” said Lee, a certified arts and crafts instructor, who assessed artisans’ work professionally for seven years at the Maskwacis Artisan’s Association. Lee and others pointed out tables brimming with mass produced beadwork, blankets and clothing in generic Indigenous designs. Several tables displayed merchandise with made-in-China or India labels. 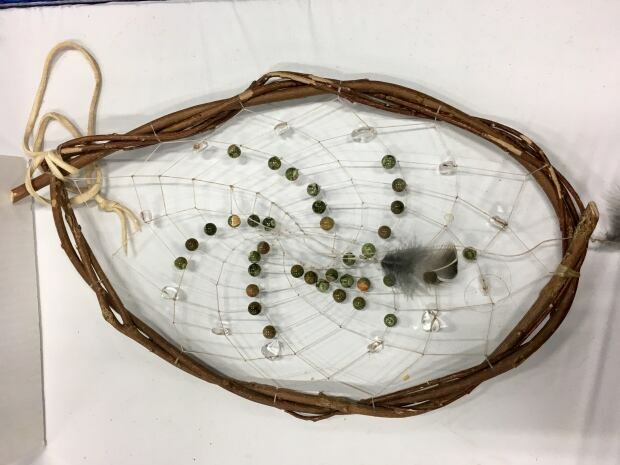 One vendor insisted she sold authentic Indigenous Canadian products but couldn’t say where they came from, explaining they were purchased at a trade show. Earlier this month, Canada’s national funding body for the arts — the Canada Council for the Arts — took a stance against cultural appropriation, announcing it’s implementing a new system for assessing projects that include elements of Indigenous culture. Artists or organizations seeking funding from the council will be assessed according to a new framework, requiring applicants to prove their work aligns with the council’s commitment to respect and honour of the rights of First Nations, Inuit and Métis peoples to cultural sovereignty. But Lee said it’s common to see the sale of culturally appropriated merchandise at Alberta’s Indigenous events, where little screening takes place. The vendor registration form for the elders gathering only requires basic information like name and address. No information is requested about the origin of where goods are made. Cultural appropriation at these events can lead to authentic artisans being squeezed out, struggling to get by with no laws to protect them, Lee said. “It takes away the opportunity for us to feed our families,” said Lee, 51, who has three grown daughters and faced serious health challenges recently due to prostate cancer. He said artisans tend to have less in the way of financial safety nets. It doesn’t help, said Lee, that many can’t afford event fees. The cost of a table at the elders’ three-day gathering was advertised as $1,000. Lee managed to get in on a discount after an emergency forced the sudden departure of another vendor. Lee suggested organizers at such events could introduce a “communal trading post” for those who can’t afford the fees. B.C vendor Paulette Flamond pointed out stall after stall selling blankets, shawls and other goods produced overseas decorated with North American inspired Indigenous patterns. “What they’re doing is they’re replicating our native art or native designs but nothing is going back to the local artists,” said Flamond, executive director of the Northeast Aboriginal Business Centre in Fort St. John. In contrast, Flamond’s display was of hand-picked medicines, moosehide mukluks stitched by elders and paintings by her husband, prominent artist Garry Oker. Last November, the couple launched the Indigenous Artists’ Market to represent local Indigenous artists for northeastern B.C. Flamond suggested cheap replicas might appeal to some simply because they’re affordable. Indeed, a table stacked with Indigenous-inspired, made-in-China blankets drew a steady stream of shoppers. The vendor declined an interview, but mentioned his Indigenous customers liked his products and prices. Flamond, a fashion store owner who has long sold Indigenous art, proposed a return to juried shows she used to see years ago, which required submitting photos and proving your Indigenous ancestry. She urged shoppers to be aware of the source of their purchase. Lee hopes to see more Alberta galleries and shops support local Indigenous artists rather than selling merchandise through distributors. He called on Indigenous leaders to take a stand on the issue of culturally appropriated Indigenous arts and crafts. “We have been left out of this for too long,” he said.